The last piece of electronics is the Barograph. 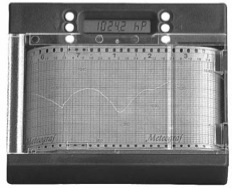 We have a Meteograf Barograph which is a hybrid electronic and analog barometer. A digital displays shows the current pressure and the change in pressure during the last 1, 5, 15, 30 and 60 minutes. A paper chart displays the pressure over the last 3 1/2 days. It is entirely self contained with only a single roll of paper and battery necessary to keep it running for an entire year. It’s really a nice unit.